Which upcoming NBA free agents hurt their stock the most in 2018-19? These players are entering free agency at the wrong time. The last thing a pending free agent wants to do is have an off year before they are about to hit the open market. Unfortunately, there have been a handful of NBA players who have turned in dismal seasons during contract years this season, and they’ll likely see less money this upcoming summer because of it. Here are five free agents who hurt their stock the most with poor performances in 2018-19. The Pacers appeared to score a bargain when they inked the talented combo guard to a one-year, $12 million deal coming off a productive season in Memphis where he averaged 19.4 points, 5.2 assists, and 5.1 rebounds per game. The former NBA Rookie of the Year was expected to solidify Indiana’s low-scoring bench. Unfortunately for Evans, he has taken a significant step back in 2018-19. In 60 games, Evans is averaging just 9.9 points, 2.8 rebounds and 2.4 assists per game. His usage is down, as are his shooting numbers. Evans is shooting 34.2 percent from three and just 38.7 (a career low) from the field. With Victor Oladipo suffering a season-ending injury, Evans had the chance to seize a bigger role and up his production. Instead, he has struggled. The Pacers have managed to stay afloat despite Evans’ inconsistencies, but as a pending free agent, he is likely looking at another one-year deal with less money on his new pact. It seems like forever ago that Burks was considered a big part of Utah’s future, but after signing a four year, $48 million deal in 2014 and getting traded twice in the last six months, his value has hit rock bottom. Burks was semi-productive for a terrible Cavaliers team, averaging 11.6 points while shooting 37 percent from three. But, with the Kings, he has barely gotten off the bench and done nothing when he has. In 11 games with Sacramento, Burks has averaged 2.0 points and 10.3 minutes per game. It is a far cry from the double-digit average he maintained in Cleveland and Utah. Burks was looking at a one-year deal in the ballpark of $5 million before landing with the Kings. He is probably now going to see veteran minimum and make-good offers this summer. Caldwell-Pope has hit gold in consecutive seasons in free agency, earning $18 million on a one-year deal with the Lakers last season and $12 million on a new one-year deal this season. There’s no way he gets that kind of money again in free agency. In his second season in Los Angeles, Caldwell-Pope has gone from the starting unit to a reserve. His stats have suffered because of it. On the surface, his 10.1 points per game seem passable, but his 34.6 percent three-point percentage isn’t good enough for a guy who gets plenty of good looks alongside LeBron James and is getting paid to hit threes. While he’ll occasionally explode for a big night, too often Caldwell-Pope disappears for prolonged stretches. Bron had Rivers pinned deep and Caldwell-Pope pulls a contested three. 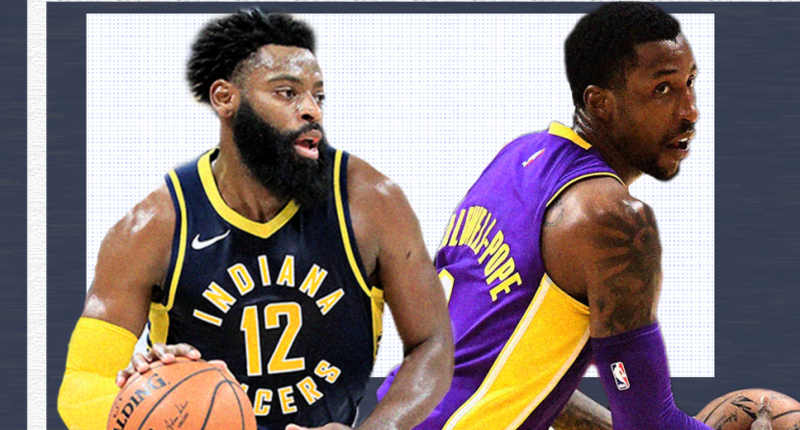 It doesn’t help that Caldwell-Pope has been mediocre defensively, despite having a reputation as a strong defender—although, the Lakers as a whole are a terrible defensive team. Don’t expect Caldwell-Pope to get another contract in the eight-figure range annually. He doesn’t deserve one. While he could easily still be an effective rotation player in the league, 2018-19 proved to be an unfortunate step back. He’ll likely be looking for a new home this summer. Shumpert has gone from starting for a potential playoff team in Sacramento to riding the bench in Houston. In the process, the 2016 NBA champion has seen his free agent stock crater. The Cavs signed Shumpert to a four year, $40 million deal in 2015. He responded with inconsistent play, but after landing with the Kings it seemed Shumpert found a home. In 42 games (40 starts) Shumpert averaged 8.9 points per game while shooting 36.6 percent from three while playing solid defense. He has been ineffective since joining the Rockets. Houston seemed like a great destination for a three-and-D player like Shumpert, but the fit has not gone as planned. He is averaging 3.9 points and is shooting 26.8 from the three and 31.6 from the field in 18.1 minutes per game. Just a couple of months ago, he seemed destined to land a contract in the range of the mid-level exception. Shumpert has not done enough to justify getting a multi-year contract or even an incentive-based one-year deal in the summer. Singing Hezonja to a one-year, $6.5 million deal made a lot of sense for the Knicks. Taking a chance on the former lottery pick who had his fourth-year option declined by Orlando and finished the 2017-18 season with promise was exactly the type of low-cost, high-reward moves a bad team like New York should make. While Hezonja has delivered two of the most unexpected plays of the year, his production hasn’t met low-to-middling expectations. In 51 games (17 starts), Hezonja is averaging 8.1 points in 19.7 minutes. For a dude that is supposed to be a shooter, he has been subpar from the three, shooting just 29.5 percent while making 40.4 percent of his shots from the field. The 6’8″ small forward still struggles to create his own shot and use his size to his advantage on smaller players. His wildly inconsistent game has provided glimpses of potential every now and again, but Hezonja has not been able to sustain success for a prolonged period of time in the NBA. He could have used his season with the Knicks to restart his career. Considering his current production, next season might be his last chance to prove he is an NBA-caliber player.